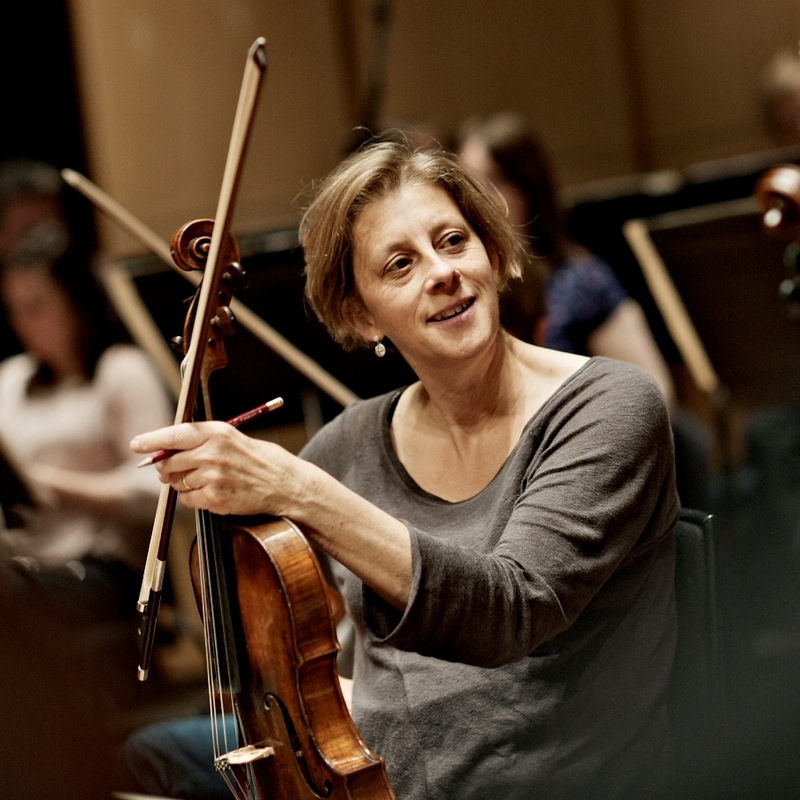 Clare grew up in Letchworth, North Hertfordshire, where after hearing a professional string quartet perform live at her primary school she was inspired to begin studying the violin with the quartet’s leader, Anne Macnachten. As a result, and thanks to an amazing County Music Service, Clare’s early musical life was one immersed in chamber music playing. She then went on to study with David Takeno at the Guildhall School of Music & Drama, where she was awarded the Birdie Warshaw Prize for Unaccompanied Bach and the School Viola Prize. While still a student she co-founded and was principal viola in the Guildhall String Ensemble, coached by David Takeno. The group, who were international prize-winners, toured worldwide for the next 20 years, making their Carnegie Hall Debut in 1991. They appeared on Blue Peter and Omnibus, made numerous recordings for RCA Red Seal and broadcast frequently on BBC Radio 3. As soloist, Clare has performed at the Aldeburgh, Brighton and Malvern festivals, at the Wigmore Hall and throughout the USA. She recently stepped up as soloist at a few hours’ notice to perform Flos Campi by Vaughan Williams with Britten Sinfonia and Britten Sinfonia Voices at Milton Court. The concert was broadcast live on BBC Radio 3. Ulysses Awakes by John Woolrich was written for and premiered by Clare and the Guildhall String Ensemble. She has performed it many times. As well as playing Principal Viola in Britten Sinfonia for the last 12 years, Clare has a regular chamber group – Britten Oboe Quartet – with oboist Nicholas Daniel, violinist Jacqueline Shave and cellist Caroline Dearnley, which performs regularly at Festivals around the UK. She has also played as guest with the Aronovitz Ensemble and the Nash Ensemble. As a session musician Clare is proud to be one of about 90 musicians on the soundtracks to films such as Tinker, Tailor, Soldier, Spy; The Hobbit and James Bond ‘Skyfall‘. She has played live with Sting, Bjork, Kylie Minogue, Florence and the Machine and also Kiki Dee and Carmelo Luggeri. Her viola is ‘unknown’, possibly Italian or Flemish, dated 1685.